At Alpha Environmental, we work to find environmental management solutions to a number of hazardous substances and chemicals which can be found around the home. Although the environmental impact of substances like lead paint and asbestos are now well recognised and regulated, there are plenty of other commonly used household chemicals which have an adverse effect on the environment and human health. This week, we take a look at how you can reduce your household chemical consumption and embrace green alternatives. Many of the pesticides, fertilisers and chemicals we use on our gardens are inferior replications of natural ecological processes. In other words, nature is far more effective at doing what these substances do, we simply need to educate ourselves about how to harness its power. Enter permaculture, a natural farming philosophy which aims to recreate or harness elements of naturally occurring ecosystems to create sustainable landscapes and minimise waste. Some common permaculture practices that render chemicals redundant include composting, crop rotation, and sheet mulching. 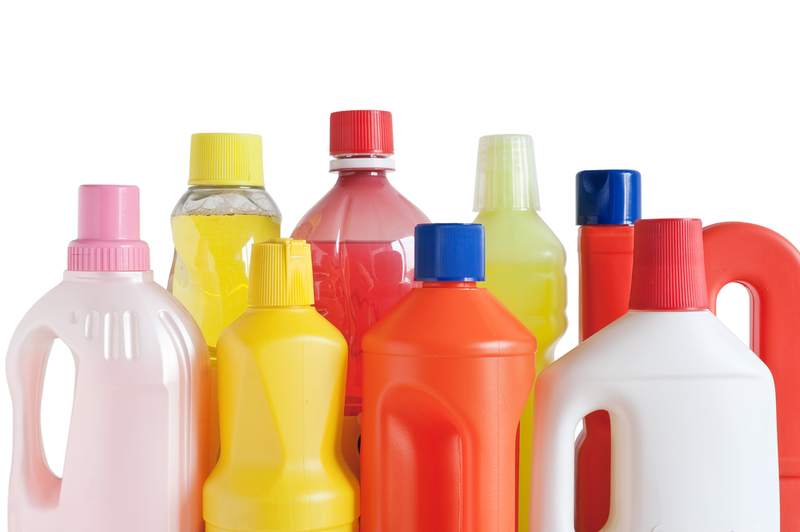 Many common household cleaning products contain poisonous chemicals which are associated with a wide range of health problems. Although these types of products are marketed as revolutionary cleaning solutions, the truth is that their effectiveness can be matched with good old bicarbonate soda and vinegar. These harmless products can be used to clean kitchen sinks, ovens, bathroom tiles and carpet stains. Other uses for bi-carb which can replace chemicals include deodorising and fabric whitener. Most insecticides work by attacking the insect’s nervous system. Unfortunately, human and insect nervous systems are remarkably similar, so the human nervous system is also susceptible to damage from insecticides. Happily, it is possible to kill and repel insects using harmless products found around the home. Setting beer traps for snails and killing cockroaches with a mixture of bi-carb and sugar might sound a little unorthodox, but they’re a much greener alternative to chemical sprays. Not all products lining the supermarket shelves are filled with harmful chemicals, but you need to be conscious what to look out for to ensure you don’t inadvertently bring home potentially harmful substances when you do your weekly shop. Some chemicals to look out for in store bought cleaning, laundry, ‘antibacterial’ and personal care products include phthalates, perchloroethylene, triclosan, quarternary ammonium compounds, 2-butoxyethanol, ammonia, chlorine and sodium hydroxide. Alpha Environmental offer specialised environmental consulting services for Melbourne homeowners, businesses and property developers. To learn more about our capabilities, please don’t hesitate to get in touch by calling 9415 8002.